I’m Irish. That’s the short story. My father’s parents were born in the small seaport of Sligo, on the northwest coast of Ireland. I never knew them; they both died before I was born. In fact, Dad doesn’t remember his mother because she died when he was just three—of peritonitis from infection after an appendectomy; his distraught father swore he’d murder the surgeon. Then at sixteen, his father died. At sixteen, my father was at the mercy of his own wits … of which he had plenty. Dad holding his two grandchildren, my sister on the left, me on the right. 1977. Black wavy hair and bright cobalt-blue eyes, large floppy ears and large knuckled hands, Dad had a way with words. He always won the scrabble games. He recited Tennyson and Robbie Burns at length. When I complained about a teacher, he cautioned me “Learn in spite of the teacher.” When I dedicated my first book to my mother, who was overjoyed for days, I was worried Dad would be jealous; but he said, while shaving one morning: “Never miss the opportunity to make someone happy.” After my divorce I was a very sad young woman. What can a father do? He sent me a letter that contained three words: “I love you.” That letter is over fifty years old now, tucked away in my jewelry box. And there’s the time Dad and I were visiting my friend Carol in the wilds of rural Florida, near the Everglades. (You should see the size and speed of the spiders, let alone the alligators.) One night we were wakened by loud crashing noises in the brush outside the house. Carol ran quietly in bare feet from her bedroom and whispered that there’d been a lot of break-ins lately. What to do? How to defend ourselves? The cocker spaniel trembled and hid. Dad ran noisily from the couch in the living room, slammed a door and shouted, “Harry! Get the gun, get the gun!” Harry? Gun? You have to hand it to my dad. At some point, as a young adult, I began to miss having grandparents – that path back and back. 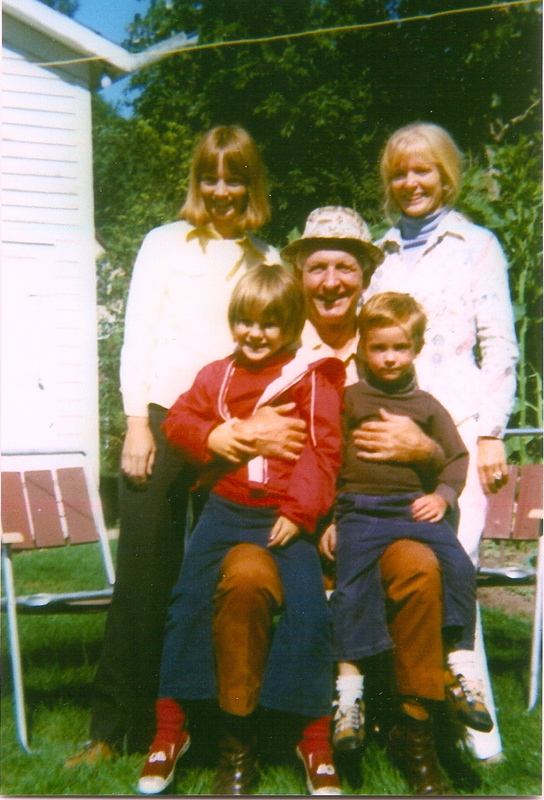 There was no one to call ‘grandpa’ – not on my mother’s side, either, for he died before I had a chance to meet him. And her mother died while still in her twenties, when Mom was five. In the absence of living ancestors, I longed for connection with my forebears dead and buried. I felt the absence as a presence – it accompanied me like a melody droning in the distance, like an Irish lament. I needed psychic connection to those from whom I was descended. What were their dreams, their struggles? Were they farmers, plumbers, poets, midwives? What was life like in Ireland? Why did they come to Canada? What were their stories? How would I feel by knowing them? Therefore, in my mid-forties, I recorded an oral history of my father’s memories of stories he remembered of and from his father. We met twice a week for a month. At the time, I was a French teacher, indulging my fascination with language. So it was with great astonishment and delight when Dad told me how, when his aunts and uncles came to visit in Brantford, Ontario they would start in English. Then the English would get “very broad”. Then, when they reminisced about Ireland they would get excited and it would become pure Gaelic. “Gaelic!” I said, startled and thrilled. Yes, he said. “They probably spoke Gaelic at home and in the streets, and learned English at school.” Just knowing that left me breathless—though Gaelic itself opened up another mystery. Soon after, I took classes in conversational Gaelic … but no matter how hard I tried, Gaelic would remain a mystery. Still, I am fiercely proud of my wild linguistic roots. “In Ireland, my dad played soccer (what we call football) and hurling, which is a vicious game played with a stick and a ball that is smaller than a lacrosse ball. The main idea, of course, was to go after the ball, but Uncle Harry would say that it wasn’t a real game unless you forgot the ball and went after somebody’s head. “My mother, Annie Sheeran, was a singer back in Ireland. She sang with John McCormack before he became famous and made hundreds of records. “My dad didn’t ride horses as far as I know. The main means of transportation in Ireland was bicycles and jaunting cars. These latter were two-wheeled carts drawn by a pony or donkey. “I never heard my dad talk about going to the pubs in Ireland, I guess because it cost money and they wouldn’t have had much. The economic conditions there were one of the reasons for coming to Canada. Memory of the famine was still recent. “When my dad and Uncle Harry and Uncle Joe and Aunt Liza got together, they would reminisce about life back in Ireland. Good stories! Sometimes, at night, they would go out and steal a sheep. Astonished, I asked What for? To eat, he said, in a tone of voice that implied ‘what else?’ Well, who from, I asked, my mind still boggled. He was laughing, and said, as if it was a silly question, from somebody who had them. One night, my dad and Uncle Harry and a third person got together and told this story, and I heard it many times after that so I guess it’s true. They’d been biking around during the day and had seen some sheep on a farmer’s land, and they went back that night on bicycles to get one. The way they always did it was to stun the sheep with a pick handle and then drag it away. So this dark and moonless night, they went back to the spot and came to the stone wall that surrounded the field. They parked the bikes and climbed over, and a bit beyond, they saw this white shape lying on the ground. Aha! A sheep! Uncle Harry swatted it with the pick handle and the thing rose up in front of them like a huge ghost. It was a big white horse. Dad is laughing one of his almost uncontrollable laughs. It put the fear of God into them, and they turned and ran, blind with terror, and ran right into the stone wall. They were going so fast that their bodies flipped right over the wall, and they kept on going. Dad is laughing and laughing. They’d have been eighteen or nineteen at the time, and there were many times when they went to bed hungry. Tears of laughter are in danger of turning into something else, but Dad is adept at turning the conversation around. Progressing into my dad’s past, gave me a deeper understanding of my father, of myself, and of an era. Bringing departed ancestors into my life expanded me. I walk accompanied by ancestral music and ancient wisdom. I walk accompanied. Wonderful story Diane!! Thoroughly enjoyed it – especially as I never knew my grandparents either. This leads to genealogical investigation…..but fascinating stuff! Amazing that you never knew your grandparents either. I wonder just how common that was. My mother’s grandparents came over to Halifax on an Irish immigrant ship. Joseph Howe the premier of NS picked them off the dock and hired them as his cook and coachman. When they retired they moved to Louisbourg and opened up Snow’s Tavern. which later was my grandmothers boarding house. I lived there for a little while. That is a great story; living history. What a good idea to record your dad’s memories. I had a deep connection with my grandma, who passed a way a couple of weeks ago, at 96, and enjoyed listening to her stories of the past. Once, I took notes of all her experiences during WWII. I feel very fortunate to have had this deep connection with her and I am sorry that you had to grow up without grandparents. They can certainly leave an impression. I never knew my dad’s dad, because he passed away when my dad was 18. It does create an empty space inside me to never have known him. Those notes you took while talking to your grandmother about WWll will be amazing to read years from now. You have honoured her this way – thank you. Am delighted that you have connected with Diane! Nice reminiscence, nicely done. Thank you! And BIG thanks to you for all your help!!! , Thanks for sharing such wonderful stories/memories. Your ancestors almost come to life in the telling. Thanks. They do pretty much leap off the page, don’t they.Thanks to my dad’s way with words. Thank you, Diane! I enjoyed reading that! So glad you enjoyed it! Great to have you drop in. Wonderful! You write so beautifully, Dee! Thanks so much, Kathy. Have so appreciated your consistent enthusiasm over many years! Between the lines, Diane, you seem to be telling us that your Dad went a long way to making up for the lack of grandparents in your life. Maybe your reminiscence is really more panegyric than lament? Abrazos! Ah, yes indeed. I’m glad you picked up on that. He delighted in giving – whether it was flowers or stories! 🙂 Hope you are writing up a storm surrounded by Latino warmth and cuisine. Talk to your old ones, talk to your young ones. Record these talks if you can. Thanks Felicity! Lovely to have you drop in. See you soon. What a rich blessing of an ancestry that you have, Diane. Your father sounds like an interesting man. Great that you wrote down some of that oral history. And now I understand even better your love for language. A fine post about the importance of story, languages and learning about one’s background. Cynthia, yes, makes for a rich nutritious soup that feeds the soul – as you know so well. Still looking forward to that book of Jamaican quotes from your Aunt Rose. … and all these years, I never knew – I really wish I could have spent some time with you his month, but my time was governed by David’s health. Will try for next time, God willing … I really, really, loved the quote by Richard Wagamese, reminded me so much of my First Nation endearing friend, Lolly Whetung (Who definitely has the wit and wisdom to write his own story …) You story is truly touching, would have loved to meet your dad. Actually, you did meet my dad – on Pine Cay in the early eighties. But it was quite the tumultuous time … Whetung – there is a gallery near Bobcageon called the Whetung Gallery. We will have lunch one of these times!!! Very nice, and easy to relate to. I know what you mean about growing up without grandparents. Everyone else talks about visiting them, and it’s easy to feel left out when everyone else is spending the holidays with grandma and grandpa. We may be in the minority, but back in those days, before antibiotics, it was more common for people to die young. See the first response above. Your kids have done well – must have surprised your dad! But the kindness – the Irish do have huge hearts, and I’m glad he lavished you with it when you were in need. What a wonderful story, memories of not just this and that but the raw emotions and humour. I’m currently writing my mother’s story – a pioneer in the workforce combining with traditional family responsibilities. My late father wrote his story and it gave such insight into his values and why he did and expected things to be done in a particular way. Diane, have tweeted your blog. I’m glad you are writing your mother’s story. We learn so much by going back, and you honour her by making efforts to understand her life and to preserve it on paper. Thank you for your comment and for tweeting. Your bio is very interesting, as is your website. i have had chronic pain, although very little now. And very important to recognize our psychic abilities. Just going through some messages. It has been an exciting time since my post – long story short: my research has led to my mother being recognised and I am delighted to announce that Patricia Evans has been accepted into the National Pioneer Women’s Hall of Fame (Alice Springs Australia) for her pioneering work (from 1949) in the male-dominated field of accounting. Thank you for sharing your story! I found it moving. Enjoyed my little morning visit with you Diane, great story and I can relate to so much of your feelings as I never got to meet my English grandparents either. My mother spoke often about her’s though so I felt I knew them – my father, not so much. Thank you for quoting Richard Wagamese – I hope his gift of words will become his living legacy. I am still keenly feeling the loss. Richard was the inspiration for this post. I was reading his “One Story, One Song” and it’s all about the value of story of course, and so I got thinking about my own. So it was with his permission, his urging, that I wrote about this. And you, too, have lived a grandparentless life – knowing that makes me less alone with that absence. Big hug for you, Elizabeth, for your loss of Richard Wagamese. Huge loss for all of us, but you knew him well. He did believe he would continue his spirit journey after his death … I think there is hope in that. Wonderful memories Diane – a lovely tribute to your father and the thread of your history. The 3-word note from your father post-divorce brought tears to my eyes. And familiarity. Just like something my dad would do. And the stories of his ancestors with poverty so stark that they considered stealing sheep and were able to laugh at their failure in spite of their hunger. How lucky we are not to have to face that kind of poverty but how lucky they were to laugh and smile in the face of it! Great story! A lovely post, it brings your father to life. I listen to old recordings of John McCormick at times! So interesting that you know of and listen to John McCormack! You inspired me to listen to some on you tube, and his voice does pluck at heart strings. Plucked a few tears, too! We are all stories and the more I connect with other people’s stories the richer my own gets. What a wonderful discovery to have made about your own past! Indeed. reading or listening to other people’s stories is addictive. The diversity of experiences is inexhaustible. Thanks for dropping in.